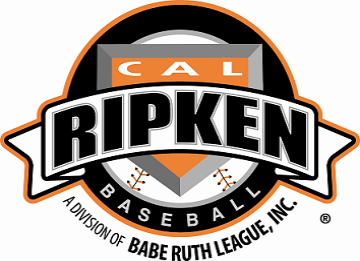 Cal Ripken Rules | Newtown Babe Ruth League, Inc. Comment: Requires the pitcher, while touching his plate, to step directly toward a base before throwing to that base. If a pitcher turns or spins off of his free foot without actually stepping or if he turns his body and throws before stepping, it is a balk. Cal Ripken Baseball is a community based program for 5 year olds through 12 year olds. Cal Ripken Baseball is played under the Official Baseball Rules, but implements some special rules as necessary for the development and welfare of this young age group. Age as of April 30, per Babe Ruth rules. Below are general guidelines used for each division. These guidelines are not all inclusive. All weekday games start at the time designated by the division directors on the published schedule and should not run more than 2 hours. All weekend games must conclude within the assigned time slot. All games will end at the bottom of an inning. The coaches will umpire games. A coach stationed behind the pitcher's mound will call balls, strikes and outs. There will be no infield fly rule in effect. Four balls have been called. The batter has struck out. All players registered in these divisions shall participate in evaluations held prior to the spring season to determine their skill level relative to other players in their division. These evaluations shall be age-appropriate and will be used for team selection purposes only. The division director and the head coaches in each division shall conduct evaluations for their division and serve as evaluators. All players shall be evaluated in pitching, catching, hitting and throwing categories. If it is the intention of a division director to forego this requirement due to the fact that he/she feels there is adequate information available to ensure the league’s objective of team parity, they must obtain Board Approval in advance. Once preseason evaluations are completed, the division director, with the assistance of all head coaches in his or her division, shall compile the information obtained from these and any prior player evaluations to establish the rankings of players within the division. This information shall be distributed to the head coaches for the sole purpose of team selection. c. Home team (established by the schedule) will occupy 3 rd base dugout at Glander 2. The batting order will consist of all players (running order). 9 players will play in the field (3 outfielders). Outfielders must play a minimum of 10 feet from the back edge of the infield. A player may not be benched for two innings until every other player has been benched for one inning (second benching may be in the same inning that a player is benched for first time). A team may play with 8 Players. The other team should supply a right fielder (which player shall be the last player to make an out, or the last batter in the order for the first inning). If a team only has 7 players, then it is a forfeit. Each player must play the infield for a minimum of 2 innings and Players may not play more than two innings at any one position (except catcher and pitcher where limit is 3 innings). Stealing is permitted (incl. Home) unless a team is leading by 7 or more runs. Runners may still advance on wild pitches regardless of score. There are no restrictions on overthrows, unless the ball is out of play. Runners may advance at their own peril. Teams will bat until three outs have been recorded. 10. There is no mercy rule. 11. Balks are called. 1 st offense is a warning, subsequent offenses result in awarding the runner(s) a base. Umpires may use discretion for “minor” infractions. 13. The infield fly rule is in effect.